When I mention Ferruccio Busoni’s name in conversations with musicians, many state that they think of him primarily as a legendary pianist with a penchant for altering notes, or else as a transcriber of J.S. Bach’s compositions. Some can name a few of his better-known compositions, such as his final opera, Doktor Faust, or his piano elegies. However, it is rare for anyone to be able to name more than one of his composition pupils. This unfamiliarity with Busoni’s pedagogical activities is somewhat understandable. Aside from his mentorship of students attending the composition master class in Berlin at the Akademie der Künste from 1921-1924 (Kurt Weill, Wladimir Vogel, Walther Geiser, Robert Blum, Luc Balmer, Svetislav Stančić, Erwin Bodky, Hans Hirsch, and Heinz Joachim-Loch), which has been documented by Tamara Levitz, Busoni’s activities as composition teacher have been nearly forgotten. Yet it is simultaneously puzzling, as his impact was both long lasting and far reaching, extending across the globe from Europe to the United States to Australia. Composers today still cite his influence. Many of those who studied composition with Busoni credit him with having been the most influential teacher they ever had. 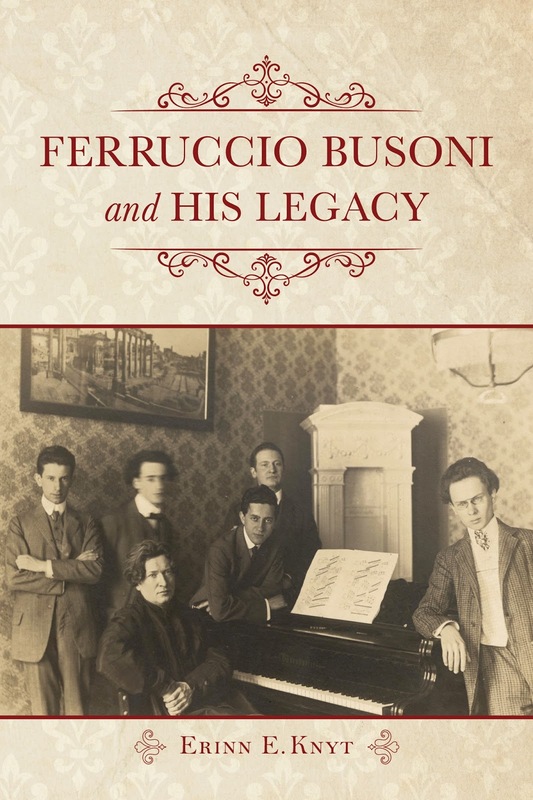 Ferruccio Busoni and His Legacy is part biographical and part critical analysis. It seeks to help remedy this loss of knowledge by documenting Busoni’s activities as a composition teacher during the early and middle parts of his career, while contributing new knowledge about previously little-understood periods in the lives and careers of several significant composers of the early twentieth century. Through archival research in collections located in the United States and Europe, it documents how Busoni taught, and describes in detail Busoni’s influence on five composition mentees who studied with him during the beginning and middle parts of his career: Jean Sibelius, Edgard Varèse, Otto Luening, Louis Gruenberg, and Philipp Jarnach. In addition to these five figures that serve as core case studies, it considers the continued transmission of his ideas to grandpupils and other followers, such as John Corigliano, Peter Maxwell Davies, Morton Feldman, Michael Finnissy, Toivo Kuula, William Grant Still, Charles Wuorinen, Alistair Hinton, André Jolivet, Larry Sitsky, and Bernd Alois Zimmerman. Because Busoni embraced many different musical styles and did not formulate any specific methods of instruction, a stylistic genealogy would be difficult to establish. Instead, he focused on transmitting his idiosyncratic aesthetic ideals. As my book reveals, Busoni preferred an informal instructional style, and avoided institutional settings. He encouraged students to create their own exercises related to their compositional projects rather than rely on his own, and he refused to systematically guide students through technical drills. He often used interactive dialogues to speak about aesthetic ideas that inspired imaginative responses and led to creative experiments. This teaching style resulted in widely divergent styles from his students, even if the students explored and embraced similar aesthetic ideas. From Sibelius’ s nationalistic tone poems, to Varèse’s atonal masterpieces, to Luening’s electronic soundscapes, to Gruenberg’s movie soundtracks and radio operas, and to Jarnach’s atonal chamber music, his students struck out on their own paths. Their music sounds so diverse that it is hard to believe that all five of these composers studied with the same teacher, but they shared Busoni’s interest in explorations of sound/timbre, stylistic pluralism, and new scales/harmonies. My book also calls for a reevaluation of Busoni’s impact on the trajectory of music composition in the twentieth century, suggesting his omission from the main narrative of music history is unwarranted. It documents how musical development was unalter­ably impacted by Busoni and his disciples as they contributed to major twentieth-century strands of composition, including electronic, textural, spectral, and pluralistic styles of music. Although a nearly forgotten composition mentor today, Busoni left a lasting legacy, the significance of which is only beginning to be recognized. This short excerpt comes from the fifth chapter of my book, which explores Busoni’s pedagogical interactions with Otto Luening. It reveals Busoni’s role in stimulating Luening’s interest in the possibilities of electronic resources. I received from America direct and authentic intelligence which solves the problem in a simple manner. I refer to an invention by Dr. Thaddeus Cahill. He has constructed a comprehensive apparatus which makes it possible to transform an electrical current into a fixed and mathematically exact number of vibrations. As pitch depends on the number of vibrations and the apparatus which makes it possible to transform an electrical cur­rent into a fixed and mathematically exact number of vibrations and the apparatus may be “set” on any number desired, the infinite gradation of the octave may be accomplished by merely moving a lever corresponding to the pointer of a quadrant. Discussions with Busoni stimulated Luening’s interest in electronic instruments as well as in acoustics and timbre. Beginning in the 1920s, he started to investigate new possibilities within traditional genres. In the 1950s, this experimentation took on new life as he explored new tim­bral possibilities through the electronic manipulation of traditional in­strumental sounds through electronic means. Since tape music can be viewed as music that is composed directly with sound instead of being first written on paper and later transformed into sound, it dovetails well with Busoni’s emphasis on sound and sonority: “This child [music]—it floats on air! It touches not the earth with its feet. It knows no law of gravitation. It is wellnigh incorporeal. Its material is transparent. It is sonorous air.” Neff remembers that Luening cited two passages in particular of Busoni’s music that were specifically shaped by an understanding of acoustics: successions of augmented chords and the stark octaves appearing after thicker textures in the Sonatina no. 2, BV 259 and the opening of Doktor Faust, BV 203 in which Busoni creates a quasi-electronic aura based on combinations of pitches reflective of the overtone series. By the mid-1930s at Hanya Halm’s Trend productions, Luening encoun­tered for the first time a playback machine, which fascinated him: “We also had a playback machine, a new kind of sound recording with a fellow named Paneyka so I got interested in projection of sound and it seemed to be very advanced and daring.” With regard to electronic music, he was particularly interested in exploring whether electronics could help him detect new relationships between a fundamental tone and its overtone series. He wanted to know what would happen if partials were displaced by transposing them toward the upper and lower threshold of hearing or if transposition beyond the normal range of an instrument would make the instrument sound new and different. In his electronic compositions, Luening took as his starting point acoustic musical sounds—often produced on the flute and played by him­self. These acoustic sounds then underwent metamorphoses as the sounds were manipulated and distorted. Repeating and amplifying pitches make the sounds spiral out with continuous pulsations, whereas changing the speed of the tape alters the register, for instance. Concern with color and timbre was indeed an important motivating factor behind his earli­est electronic works, Fantasy in Space, W. 148 (1952), and Low Speed, W. 150 (1952), which focus on the manipulation of natural acoustical sounds as primary formal components. Luening was principally interested in extending timbral possibilities using electronic means. The juxtaposi­tion of acoustic and electronic sounds creates multiple textures, timbres, and styles, a plurality encouraged by Busoni and adopted by Luening in Zurich. 69. Otto Luening, Interview with Tim Page. 70. For better understanding Luening’s theory about the evolution of electronic music consult Otto Luening, “Origins,” in Jon H. Appleton and Ronald C. Perera, The Development and Practice of Electronic Music (Englewood Cliffs, NJ: Prentice-Hall, 1975). 71. Luening, “Some Random Remarks,” 92. 72. Busoni, Sketch of a New Aesthetic of Music, trans. T. Baker (New York: Schirmer, 1911), 4. 73. Severine Neff, phone interview with the author, May 22, 2014. Neff also noted that Busoni rewrote Schoenberg’s Klavierstuck, op. 11, no. 2, because he didn’t like the timbre. 74. Otto Luening, “Conversation with Theresa Bowers,” 68. 75. Jack Beeson, “Otto Luening,” Bulletin of the American Composers Alliance, iii: 3 (1954), 4. 76. Otto Luening, “Electronic Music—First Pieces, Analyses of Fantasy in Space, Low Speed, and Invention in 12 Tones,” in 1952 Electronic Tape Music: The First Compositions (New York: Highgate Press, 1977), 32. 78. Otto Luening, “Conversation with Theresa Bowers,” 22. Halm was a dancer, choreographer, and dance instructor. She helped found the American Dance Festival and her first major work, Trend, dealt with social criticism. 79. Otto Luening, “Electronic Music—First Pieces,” 33. The book received support from the AMS 75 Pays Endowment and a Faculty Research Grant (University of Massachusetts Amherst). Biography: Erinn E. Knyt is Assistant Professor of Music History at the University of Massachusetts Amherst. Knyt special­izes in nineteenth- and twentieth-century music, aesthetics, and performance studies, and has written extensively about Ferruccio Busoni. She has published articles in the Journal of the Royal Musical Association, the Journal of Musicologi­cal Research, American Music, the Journal of Musicology, the Journal of Music History Pedagogy, Musicology Australia, 19th-Century Music, and Twentieth-Century Music. Tamara Levitz, “Teaching New Classicality: Busoni’s Master Class in Composition, 1921–24” (Ph.D. diss. : University of Rochester, 1993). Levitz later converted her dissertation into a book, Teaching New Classicality: Ferruccio Busoni’s Master Class in Composition, European University Studies, Series 36, vol. 152 (Berlin: Peter Lang, 1996). Austin Clarkson has also written extensively about Busoni’s influence on Stefan Wolpe. See, for example: “Wolpe, Varèse, and the Busoni Effect,” Contemporary Music Review 27:2/3 (April-June, 2008), 361-381.